The dermis can be divided in a superficial layer (stratum superficiale) and a deep layer (stratum profundum). There are no dermal papilla. 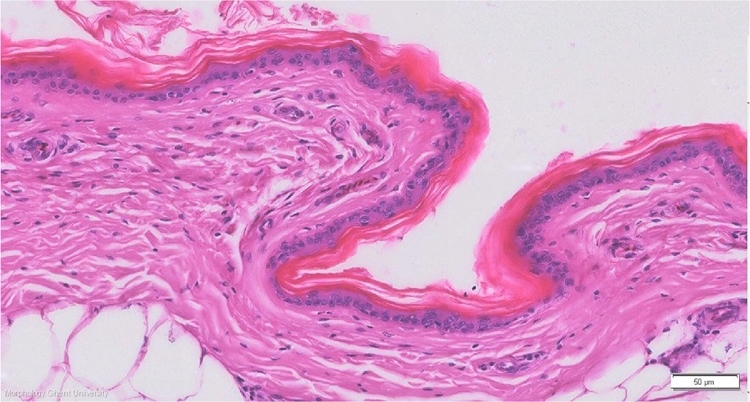 In the superficial layer, a capillar layer with sinus capillaries can be present. The deep layer consists of a dense layer (stratum compactum) with underneath a loose layer (stratum laxum). In the pterylae, the stratum superficiale and stratum compactum of the dermis are thin and hard to distinguish from each other. When present, the sinus capillaries mark the border between the two layers.